A front-line in the battle against the "terronoia-take over." Portland Oregon based Media Monarchy recently tweeted a video of We Are Change activists taking to their local city hall demanding that their city remain out of the FBI's Joint Terrorist Task Force (JTTF). In 2005, Portland became the first city in the United States to opt-out of the FBI's JTTF over concerns it would threaten civil liberties. regarding the JTTF have been nearly 100% against joining the FBI's scheme. The globalists' hopes that this story would go away were dashed as alternative media outlets like Media Monarchy and activists like We Are Change, and the good people of the City of Portland themselves, have doggedly resisted the FBI's attempt to reassert itself under the cover of what Media Monarchy calls "terronoia." 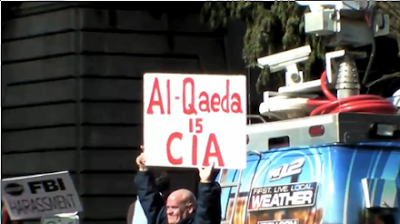 "Stop FBI Harassment" and "Al-Qaeda is CIA." Indeed, as previously reported, the FBI itself seems to pose the greatest threat as it sneaks around constructing and detonating bombs, allowing an inert device to be delivered next to a public crowd of thousands, all resulting in a high-profile arrest leaving the Mayor of Portland looking humiliatingly ignorant. This is an agency with an agenda, not an agency performing its duties. Portland's Mayor Sam Adams should be thankful the FBI didn't decide to go with real explosives as they did in the 1993 World Trade Center bombing in order to make their point and expand Federal control over the American people. What special skills the FBI offers that Portland police lack, or how Portland police could have "foiled" a bomb plot hatched from start to finish by the FBI in the first place, are all questions that remain unanswered by the JTTF's proponents and undermine not just the JTTF's legitimacy, but the legitimacy of the extra-legal Department of Homeland Security and the US federal government itself.